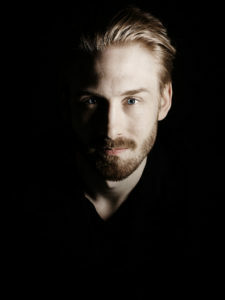 Swedish Baritone Hannes Öberg (born 1991) started singing at the age of 11. After attending highschool in his hometown Sunne he moved to Karlstad, where he studied music at Sundstagymnasiet and took lessons from organist, conductor and vocal coach Mårten Engdahl. It was Mr. Engdahl who in 2008 introduced Hannes to classical music and soon he found himself getting engagements as soloist all over the province Värmland. In spring 2010 he was accepted to Vadstena pre-college music school, where he studied with vocal coaches Anders Düring and Monica Thomasson. 2012-2015 Hannes took part in the Bachelor’s program at the University college of opera in Stockholm, studying with tenor and vocal coach Erik Årman. During these years he worked with orchestras, directors and conductors from all over Scandinavia and he even had the privilege of performing a private lieder concert for the Swedish Royal family. In 2014 he made his debut at the Royal Opera in Stockholm as Don Juan in the new opera ”My brother Don Juan”. 2015-2017 Hannes furthered his studies by participating in the Master’s Programme at the University College of Opera in Stockholm. Among recent and future engagements to be mentioned are Algernon in ”The Importance of Being Ernest” at the Vadstena Academy, Valentin in ”Faust” at Norrlandsoperan, a revival of ”My Brother Don Juan” at the Royal Opera and Maximilian in ”Candide” with the Warsaw Philharmonic.